You can read the previous posts here: Part 1, Part 2, Part 3. 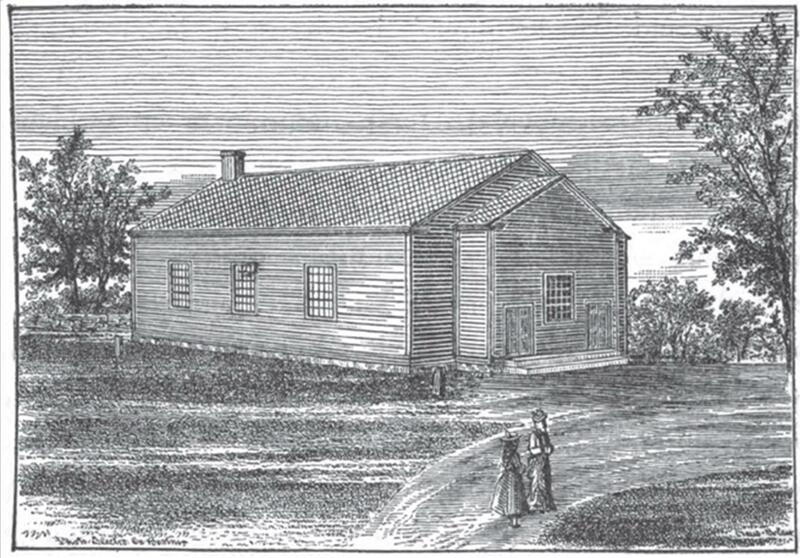 As early as December, 1818, the church, in its feebleness, had begun to cherish the purpose of “providing a place of worship,” and had appointed a committee “to form the design, make arrangements and report at some future meeting.” Just two years and nine months later, we find that committee again instructed “to take that subject [of building a meeting-house] into consideration, as soon as may be, and report whether to build, where to build, what size to build and how to defray the expense.” We may be sure that it was not from a lack of interest in the matter, that some action was not sooner reached; for Martin Torrey was at the head of the committee, and that fact in itself was enough to insure the doing of all that could be done. Finally, March 6, 1822, a new committee, with the same chairman, was appointed, with instructions “to procure a spot for a meeting-house, and make all needful arrangements for the erection of one the present year.” This proved to be the signal for action; for on Wednesday, October 30, the new meeting-house was opened for the worship of God. The pastor preached a sermon from John 4:24—“God is a Spirit; and they that worship Him, must worship Him in spirit and in Truth.” The Rev. Messrs. Barrett and Houghton, and brother John Allen assisted in the solemn and joyful services of the occasion. The church was located near the house now occupied by Mr. Asahel Dean, about three-quarters of a mile southeast of the Common. The cost of building it was about $1200 [about $20,400 in 2013], and was provided for by the sale of the pews. The structure was of the simplest possible kind—a plain, rectangular building, about thirty-six by forty feet, without tower or belfry. In the porch stood a big, box-shaped stove, with its long funnel passing through the house. It is not to be supposed that this warmed the whole house in the winter. It was enough if the worshippers could have a chance to warm their hands and feet at the beginning and the end of the service. Such luxury was never before known in a Foxboro meeting-house. There were two doors in the front end, and the pulpit stood between them. A raised platform eight or ten inches high, across the other end of the house, served as a gallery for the singers, who were shielded from the public gaze by a curtain, except when they rose to sing. The building enterprise proved to be a wise one, and the seal of the divine approval was soon given. In the following year, twelve members of the Baptist church in Sharon, residing in this town, offered their letters, and contributed their strength to this church. Other additions, by letter and by baptism, swelled the increase to twenty-four during the year 1823. The church was also cheered, in the following year, by a revival on its south-eastern border. In the course of a few months, eighteen persons, residing in the town of Norton, about eight miles distant, were added to their number by baptism, and were considered and treated as a branch of the church in Foxboro, the pastor visiting them and preaching for them as often as he could. This revival, the fruit of the labors of Rev. William Bentley, is described as “still and gradual and solemn in its progress, embracing in its results probably more than double the number that united with this church.” The records show additions to the number of twenty-three during that year, 1824. Thus in two years the church had more than doubled its numbers, and might hope that its worst trials were over. But such a hope, if it were cherished, was doomed to disappointment. For at this point the record of increase comes to a long and painful pause. From August, 1824, to June, 1881, nearly seven years, not one was baptized, and only two were added by letter. This barrenness in the record finds its explanation in the unhappy state of affairs in the church. Their trouble was of the most trying sort, namely, the defection of their pastor. He became unsettled in his religious beliefs, and for a time was carried away by the error of Universal Restoration [everyone will be saved]. Notwithstanding their respect and love for their pastor and brother, the church were constrained by the advice of a council, April 13, 1825, to suspend him from the pastoral office, and finally from the privileges of a church-member. Having renounced his errors, he was again restored by a council to the ministry, received back into the church in full fellowship and reinstated in the pastoral office. His defection lasted a little more than two years, from September, 1824, to November, 1826. For a year or more after this, he continued the regular labors of a pastor; but, the state of his health forbidding close study, on the seventh of October, 1828, his resignation of the pastorate was offered and accepted. About two years later, having united with a Swedenborgian church [which denies the Trinity, among other beliefs] in Boston, he, of course, lost his standing in this church. He continued to reside in Foxboro, and died here in 1861. He is remembered by the older members of this church with great respect. He was with them in their first trials, and labored for them with unselfish zeal. During his vagaries in belief, he did not seek to trouble or divide the church, and they treated him with kindness and consideration. As a citizen he was respected and honored till his death.